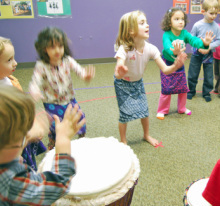 In class children experience a variety of music and dance styles that may include Guinean and other African dance, Hip Hop, Hawaiian Hula, Bhangra & Bollywood, Balinese, Brazilian, Armenian & Greek Folk, Cuban and more. 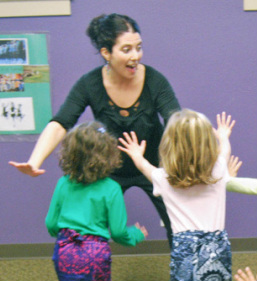 Elements of Creative Dance and Movement are combined with cultural dances in each class. 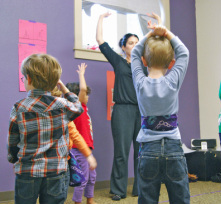 Through developing and strengthening movem﻿ent skills children build a foundation for thei﻿r own expression of dance. Stories, books, photos, videos, songs, instruments and dress-up related to the cultural dances being studied are often a part of the children's cultural experience. World Dance broadens children's awareness of their global community. In a World Dance class where there is a performance at the end of the session, the class focuses on one or two types of dance to perform in an informal setting. The children may also create their own group choreography as a performance piece. World Dance with Marissa is at these schools. Please contact Marissa if you want classes at your school. Marissa is available to teach World Dance at your school, community center, or children's event. Click on the Contact tab above. (c) Copyright 2019 World Dance With Marissa Baratian. All Rights Reserved.